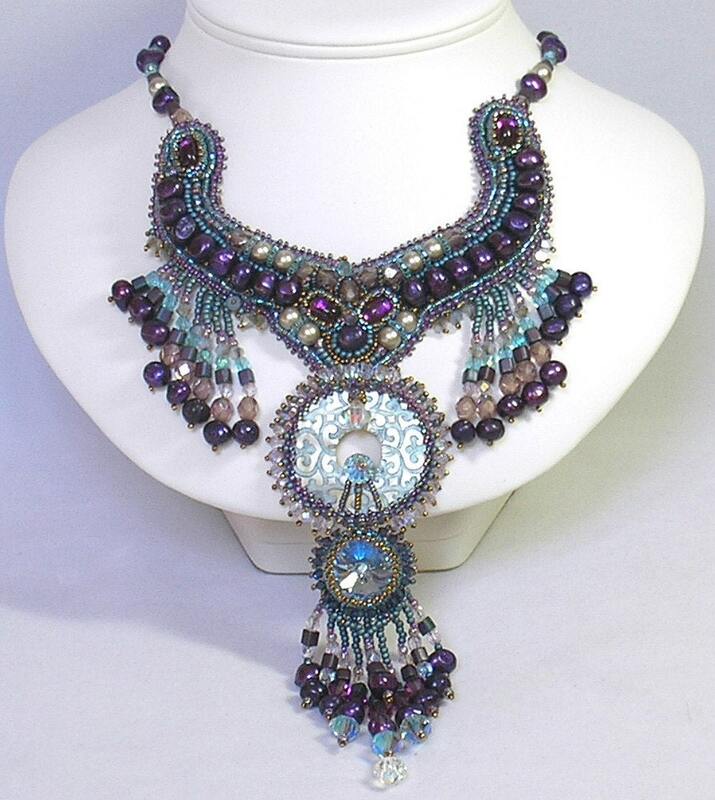 Jewelry Consignment – Should You Try It? Originally written For Artisan’s Jewelry Times, 2016. I thought that I had already posted this, but can’t find it in my blog. So if you’ve already read this, my apologies. I often get approached at shows about consigning at galleries, and my bet is that if you make and sell jewelry online or at shows then you’ve had these requests as well. You’ve probably even considered consignment, but before you do it, you’ll want to do some careful research first about the shop. I have had some wonderful experiences consigning. In particular, I’ve enjoyed consigning my work with two separate museum shops in Taos, New Mexico, as well as a wonderful experience with the John Hines History Museum gift shop in Pittsburgh. Museum shops are usually run beautifully. They have all their paperwork above board and also tend to be organized. A few times a year, I have a consignment/pop-up trunk show of jewelry and lampwork sculpture (as well as beads and patterns) at my local bead store. I work for her once a week, just doing her ordering and organizing, so she basically gives me a space and lets me set up any way I want. My work is generally only there for a week or two at a time, so it doesn’t get stale and I break down the show and clean up myself. Let’s take a look at some of the pros and cons of consigning at galleries. · As a consignor, an artist gets to keep all the legal rights to his or her work until it is sold. In this way, you can establish a name for yourself in any particular regional area. · You can elect to remove the work from your gallery at any time (although the gallery may ask for a certain amount of time between the request and removal) and also can set the retail price. This means you can test new ideas, sell large scale, one-of-a-kind pieces, and also have your work on display somewhere while not doing shows or art fairs. · You can rotate your work on display, especially if the gallery is local. · Your work is more likely to sell if it is on display than languishing in your studio between shows. · The gallery takes responsibility for the overhead costs including rent, electricity, display, and promotion. Score! · Many galleries add a higher percentage to consignment pieces than pieces they buy outright. As a result, either your retail price has to be higher or you’ll end up making less per piece than outright wholesale. · In this economic climate, galleries are feeling the crunch. They need to have a full show floor in order to stimulate sales, but at the same time, many can’t afford to buy artwork outright. As a result, they offer a show space for you and pay you on a net-30 after they sell your item (in other words, they pay 30 days after the month in which it was sold). However, too often the demands of a brick and mortar shop take precedence over an artist who resides in another state. Faced with a utility bill versus paying an out-of-state artist, the shop nearly always goes with the pressing demands of keeping the shop open first. · Galleries are often more careful with damage to and display of items that they have invested in rather than items that have been freely loaned. · Consignment pieces are often not protected by a gallery’s insurance in case of damage (fire, water, etc), theft, or bankruptcy. If a gallery closes due to any of these reasons, artists are often out money and possibly their work. · Unless you really dig paperwork, keeping track of where your artwork is, whether it has sold and whether it has been paid for can be a real headache. Perfect records are a must! I now have a written agreement when I agree to consign. It’s really boring and lawyerly sounding, but it really does the trick. I found mine online by doing a web search for “consignment agreement for artists” and changed to wording to suit my needs. If you need help finding one, feel free to email me. Let me leave you with one final thought. I have met some of my very closest friends via the galleries through which I’ve consigned. I really have to give a thank you to a Celtic Arts Gallery in Pittsburgh for pushing me to sell my jewelry; at the time, I was really nervous about the salability of my work. The family-owned business gave me a wonderful community and some of my now-best friends to show our work. Further, it really gave customers the opportunity to buy local and to buy from a small business. I truly count myself as lucky. A fun history of the Steampunk Genre and a good inspiration book that will allow you to see the possibilities in items you might otherwise overlook for your jewelry making stash. I’m primarily a seed beader, so this book really speaks to me. 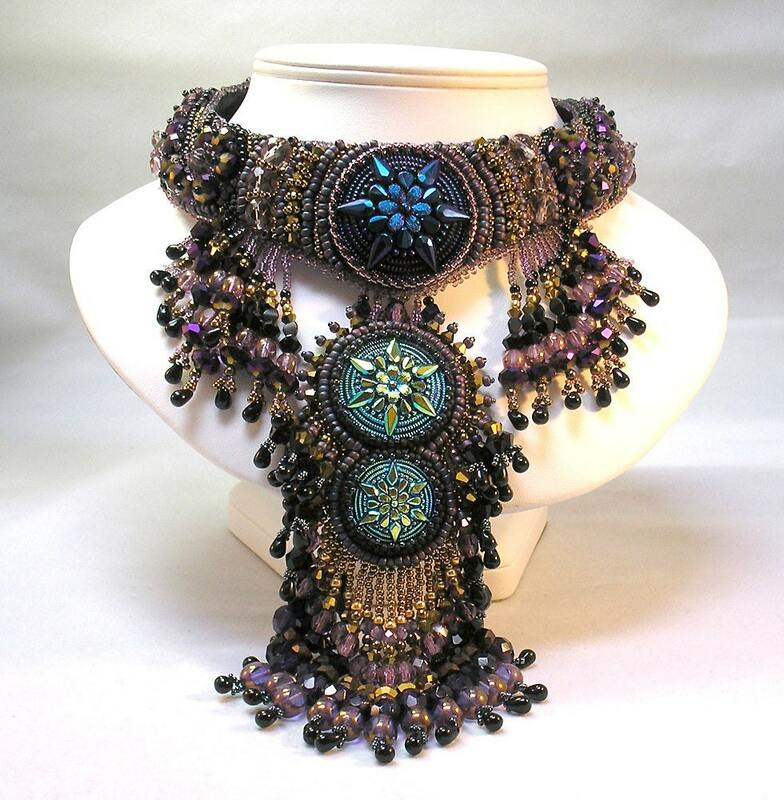 Lovely combinations of seed beads and found objects. I’m primarily a seed bead artist and lampworker, so it stands to reason that I should be fascinated by other media, especially when I have a looming deadline. This past year I took a full year away from bead shows to work on redesigning my teaching projects and to allow myself play time with multimedia design work. When I think of multimedia jewelry, I think of two very different types of work. The first is created from found object and upcycled materials. The second uses fiber and other materials not usually found in jewelry. I’m going to give you a short look at each. My very first introduction to found object jewelry was in 1993. I’d taken exactly one metalsmithing class in my life when Robert Ebendorf, a leader in the studio jewelry movement, came to teach at the Pittsburgh Center for the Arts where I was teaching a beginning class on beadwork. Wholly unprepared, I decided to take the class and was thrown into a world in which doll parts and pieces of clock and some stuff I’m pretty sure was once alive was cobbled together into an extraordinary piece of sterling-silver-and-other-stuff adornment. You can see his work by doing an internet search, checking Pinterest here (https://www.pinterest.com/lorenaangulo/bob-ebendorf/) or checking out the small collection owned by the Smithsonian Museum here (http://americanart.si.edu/collections/search/artwork/results/index.cfm?rows=10&q=&page=1&start=0&fq=name:%22Ebendorf%2C%20Robert%22) This was way before any of us knew what “steampunk” meant. I couldn’t really take it, and made an enormous sterling silver pendant that used a tiny round opal one of my good friends had given me. Doesn’t sound much like upcycling, does it? That’s because it wasn’t, but it was all I could handle at the time. Fast forward two decades, and upcycled steampunk jewelry is everywhere. Designs range from the simplest pieces – lampwork beads made on antique keys and sewing bobbins- to complex designs with watch parts and cogs. Its no longer against design rules to mix metals; copper, silver and brass all work together. I like adding glass and silver leaf beads that have been lampworked from bottles to my seed bead work, but since its all glass its somewhat debatable as to whether it is truly multimedia. It has been upcycled. Jean Cox has multimedia in both her cuff bracelet design and also in the idea behind it. Her base for this was a found object – a shoe part! We’ve actually already looked at a pair of pieces that use non-traditional materials in the use of bike tires and shoe soles, but most of the non-traditional work I’ve done in the past few years combines fiber with my beadwork. I suspect that this had a lot to do with my guilt in not using my theatre/costume design Master’s Degree. I like the mix of textures that you can get by combining glass beads with fiber. The spiky cuff bracelet I made using fiber and beads might look like it could do some harm, but those spikes are actually soft – they are made of zippers! 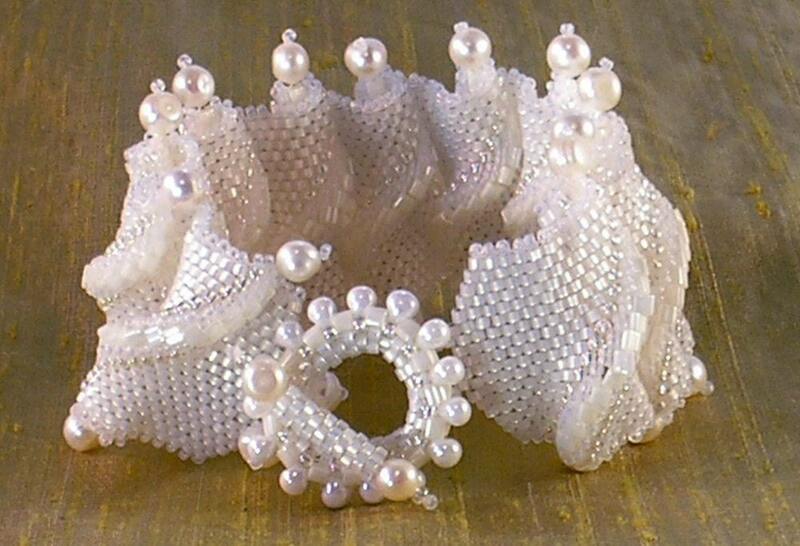 I taught this cuff (titled “Zipperlicious!”) a few years ago at Bead & Button and it was a hit. There’s nothing too weird, to strange, too outlandish. Be brave! Steampunk is a subgenre of design which fuses 19th century steam powered Industrial Revolutionary gizmos with Victorian design and science fiction/fantasy. I love it. Shawn and I will be selling at the Humboldt Marble Weekend! Two, three and four hole beads have recently taken the beading world by storm, but they are not a new concept. It all started for me with Twins and SuperDuos , two types of diamond shaped beads each with two holes in them, but it turns out two hole beads were around long before then. Now, every time I turn around, I have a new shape and finish of these mainly Czech-designed beads with which to play. As a result I sat down for short interviews with two experts on two-hole beads, Perry Bookstein and Nichole Starman. Perry Bookstein’s family owned York Novelty Imports, located in the garment district in Manhatten, New York City. He grew up surrounded by the fashion industry and the beads his family imported from Europe, and now works for as a Product Manager for Beadsmith, a prominent bead wholesaler in New Jersey. As a result, I began by asking him to tell me a little bit about the history of multi-hole beads. Hannah: Before the SuperDuos and the Twins, I’m sure that York Beads saw many types of two-hole beads. Your store (York Novelty Imports) carried both vintage and modern beads. Can you tell me about some of the two-hole beads that York stocked before the Twins and SuperDuos came onto the scene? Perry: The previous explosion of multi hole glass bead came in the late 1800’s with the production of nail head beads. These beads were molded in glass using graphite and nickel molds. They were two holed, flat on the back and faceted on the front. Today this type of facet is referred to as an antique cut bead. These were made for the clothing industry. At that time, France ruled fashion. By the roaring twenties so many of these beads had hit the market, they were also applied to handbags and jewelry. During this time the French steel cut beads, a much sought-after and rarer bead material, were produced in both seed bead shapes and in the two-hole nailheads. World War II somewhat wiped this trend off the map as beads went into storage and fashion took a back seat, but the post-war Garment district in NYC kept nailheads in our beading vocabulary and in our inventories. During the eighties (1980s) and nineties not many two hole beads were being imported to the United States. At that time, simple stringing reigned in the American bead world.. Once the multi hole beading market took off, the historical nailhead beads were studied to see which shapes made sense. Hannah: Why do you think the Twins and SuperDuos took off so well? Was it marketing, or something else? Perry: Actually, Twin Beads were a Czech bead company called Preciosa’s response to the Tila, a two-hole bead produced by a Japanese company called Miyuki. The Tila was basically a little square bead with two parallel holes running through its length. Both of these shapes took off due to the increased popularity in seed bead craft. Unlike the earlier beadwork that had been pushed by the fashion industry, there was more of a DIY (Do It Yourself) interest in jewelry. In this rare case, the beads pushed the boundaries and exploration in dimension and string path without being held back by a particular fashion need and use. Instead, there was unlimited potential for creativity. As you know, Hannah, besides making new interlocking shaped designs, these beads created a phenomenon that brought the bead world closer together, both within the US and internationally. The two hole beads are often referred to as seed beads, even though many of them, including the best-selling one of them all (the Superduo) are actually pressed beads. The pinched shape of the Superduo was molded so perfectly by its creator, Daniel Matura, that it created a bead which could be seamlessly stitched with only minimal gaps. I think that, like everything else in the world from phones to sodas, marketing was based solely on success. Hannah: Tell me a little more about the changes in bead marketing. Perry: My grandfather, Sol Bookstein, started York Novelty Import Inc in 1924. Our company was an offshoot of the Garment District Era in New York City and we supplied many big names in fashion and accessories. When the Berlin Wall came down on June 12 1987, new waves of international business emerged in Eastern Europe. Along with these changes, there were technological breakthroughs and the methods of distribution began to change. The landscape of how to distribute, now worldwide, needed high end websites and sophisticated warehousing techniques. The Starman brand of CzechMates beads, a two-hole beading system defined by a uniform placement of two or more equidistant-holes, adds an element of versatility never seen before in the beading world. As a Starman Beads Trendsetter, I have invested interest in using and designing with these multiple hole beads. Nichole Starman Director of Starman Beads, has been designing Czech glass bead shapes and colors for over a dozen years. Her architectural beadweaving designs show a huge range of textural and sculptural possibilities with these two-hole beads. Hannah: I first became aware of the CzechMates two-hole system in 2013, just before I became a TrendSetter. When and how was the system first designed? Nichole: Almost any Czech bead can be reproduced with two holes instead of one, but the results aren’t always practical. 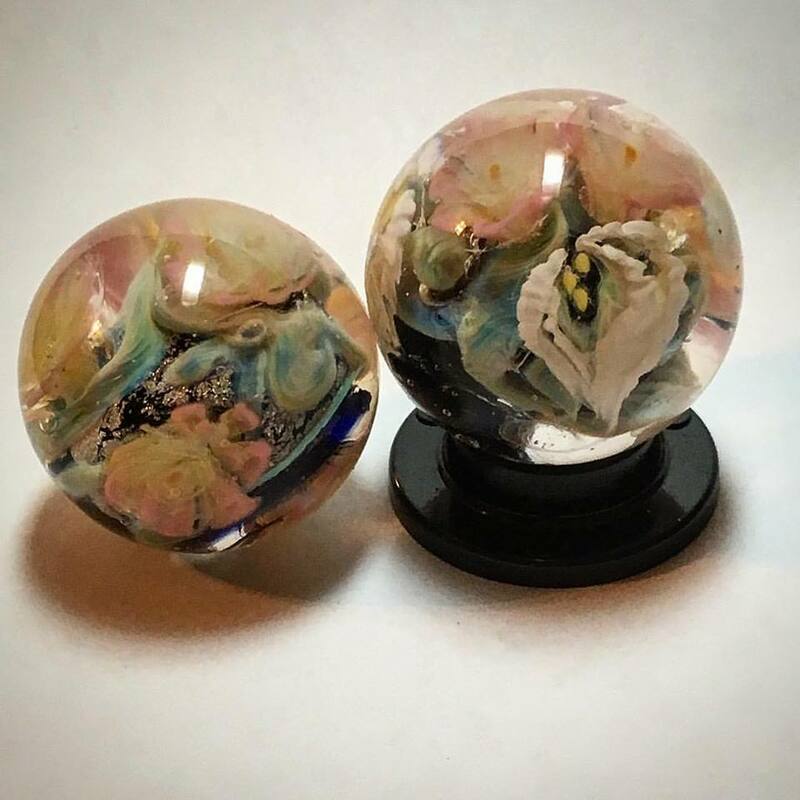 My goal is to create beads that artists can use as tools for making their own unique designs. The Starman factory (in the Czech region of Bohemia in Eastern Europe) has thousands of different mold shapes in its archives, including 2-hole beads. I was fascinated by them, but I was limited in what I could produce since most beaders I spoke to did not see a use for them beyond stringing. I developed the 2-hole Tile in 2010 and started to experiment with new stitch paths that took advantage of the second hole. I found that the flat surface of the Tile was a great foundation to build and embellish upon. During this time, I was also developing the Brick and Lentil as complementary shapes with compatible hole spacing. I noticed their resemblance to materials commonly found in the construction of buildings, which fueled my desire to create a dimensional beading system. Multi-hole beads have gained momentum over the past six years as they continue to be integrated into seed beadwork. These beads not only create structure and support, but they also make it easier for designers to integrate asymmetrical shapes into their designs. Hannah: Tell me about how you design the new beads. Do you come up with a bead first, or a design that requires a new shaped bead? Nichole: The most commonly used seed beads and shaped beads have the hole through the center and they look the same no matter how they spin on the thread. This gives designers control over the final look of their piece from every angle, but can be limiting dimensionally. Shapes that have an unbalanced weight distribution, like triangles, flat squares, and crescents used to be avoided because of their tendency to flip and dangle in unmanageable ways. Adding a second hole to these shapes made it possible to anchor them into place, giving artists more control over their positioning within a design. I take this into consideration when planning for new beads. I get inspired by reading books on architecture and observing historic structures in cities, especially Prague. Bridges and skyscrapers are created with very simple components. As with creating jewelry, the structural integrity of each building is determined by how the individual pieces are positioned and how they are all connected together. I look at the vaulted masonry of gothic cathedrals as well as the steel frame construction of bridges for ideas when determining which attributes would be good to incorporate into new beads within the CzechMates system. Once I have a concept in mind for a bead I can visualize ways it can be combined with the other CzechMates shapes to create a new texture and dimension within designs. I try not to think too far ahead about creating specific jewelry designs, otherwise it’s easy to get overly excited about a shape that may have limited uses beyond the one design. Once a new bead shape has been created I almost always find myself using it in ways I never imagined. Hannah: Tell me about the Trendsetters program and how you originally came up with the idea. Nichole: After designing for a year I realized that I couldn’t continue alone. The beads were gaining popularity and the demand for more instructional designs was growing. Many talented designers began to emerge with their own new techniques. I invited a few select designers to participate in the first TrendSetter design team in 2012. Each team member gets the opportunity to work with prototype shapes before the beads are released to the public. 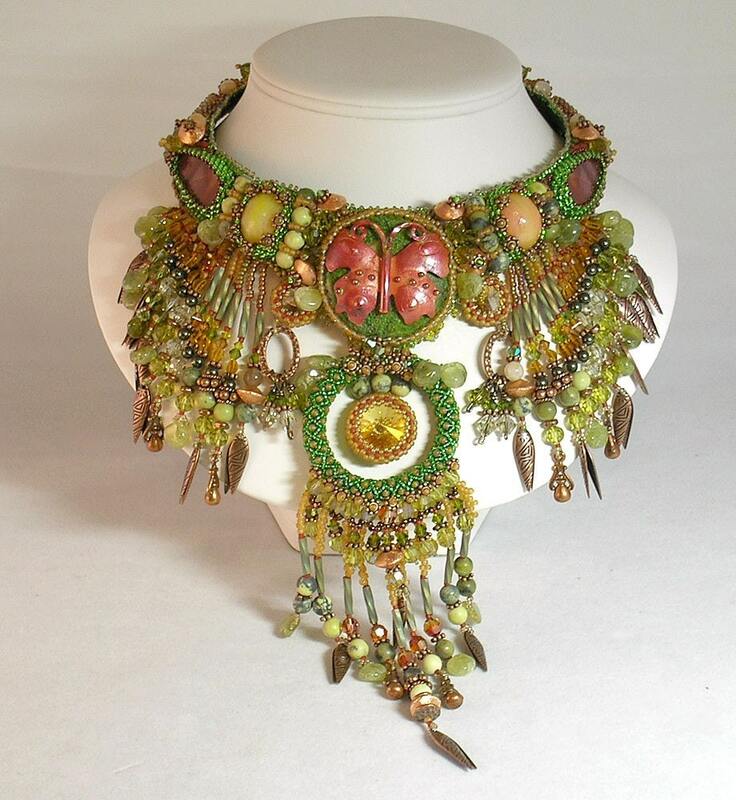 This has become a tradition that continues even now that the team has expanded to include nearly fifty designers representing all forms of seed beadwork from around the world. Hannah: My thanks to you both for your time. Riches of the Titanic Pendant made by Hannah Rosner, 2015. Uses Starman Beads two-hole Crescents and Triangles and 4 hole Quadralentils over a base of stitched York Beads two-hole Pyramids. Tutorial is available on my Etsy. Biscuit the Angler Fish made by Hannah Rosner 2015. Biscuit started his life out as a goldfish, but sometimes strange things happen in my studio. His little angler glows in the dark. Uses Starman Beads two hole Triangles, Crescents and Lentils. Biscuit is available on my Etsy. Upon request, here’s a list of some must-have beginning level books for lampwork artists who want to start making jewelry for sale or for lampwork aficionados. 12 photos to inspire you to make jewelry from your lampwork beads. You’ll need to already know basic stringing techniques and wirewrapping techniques (both are taught in Karen’s book or at the end of Lori’s book, both listed above) before you check this book out since it is inspiration shots but no directions. This little book is a free ebook with Amazon Unlimited. Although this book primarily shows seed bead pieces, it also teaching the basics of color theory and shows some great color palettes which can help you design both lampwork beads and also beaded jewelry. Its my go-to book when I am stuck in a rut of designing with the same colors over and over again (I usually pick green and purple together but until you see how lovely autumn reds and oranges and deep greens are together you might not use them in a piece). Based on the online Bead Soup Blog Party in which two beaders swap items from their stash and use them to make jewelry, this book helps you think outside of your box. Not all of these pieces are based around lampwork, but most of them can be worked with lampwork you probably already have in your stash. Ends with a lovely section showcasing some more advanced inspiration projects and a glossary of basic jewelrymaking techniques. I know this wasn’t the first listing in my book shelf but this one is by far the most comprehensive. I’m not just saying this because I enjoy my editor for the Soda Lime Times – Karen has really filled a need in the lampworking world with this book by answering the question “I’ve made all these beads – NOW what do I do with them?” It has tutorials for both the jewelry and for the beads that are featured in the projects. In addition it also gives a list of the tools you’ll need to set up a good quality professional beading studio. Want more? Right now the ebook is free on Amazon Unlimited. Don’t be intimidated by the lovely bracelet on the cover. Although that piece is one of the 12 projects in the book, the projects themselves go from beginning level all the way up through intermediate levels. Most of the projects are beginning however. A great way to learn wirewrapping with clear photos and beautiful step by step projects that can easily be adapted for lampwork beads. Further – wirewrapped and lampworked jewelry seems to be the hot sellers on Facebook jewelry groups just now.